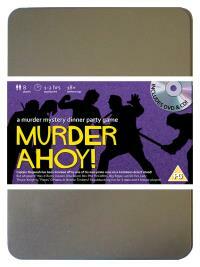 You've been invited to play the role of RUSTY CLEAVER in Murder Ahoy. You are invited to a swashbuckling murder mystery set in the tropical waters of the Caribbean! Captain Mugwash and his pirate crew are shipwrecked on a desert island where they find a buried treasure chest. But during a drunken celebration on the beach the Captain is discovered slumped over the chest, murdered! Please join us to find out who buried the ol’ Sea Monkey! Ship’s Surgeon (so much as a cough and he‘ll lop it off!) Costume suggestion : Your white apron and shirt are splashed with blood from all the handiwork you do. With your small medical briefcase of „tools‟ you are ready for any surgical emergency (and quite a few culinary ones too!) Occasionally you‟ll consult your pocket watch to time just how long a crew member is in pain. After seven years attending to the medical needs of the crew of the Dirty Monkey, I’ve lost count of the peg legs and eye patches I’ve fitted. If it wasn’t for me, most of the crew would have succumbed to scurvy years ago, not to mention those other sorts of diseases everyone keeps picking up!